On top of a small hill, in the heart of Biarritz, "Petit Atalaye" can pride itself with one of the best views of our portfolio. The large windows facing the ocean will draw your attention to the blue waters, the stunning architecture of Biarritz, and the lighthouse perched on a rocky cliff. Luxury contemporary apartment with sea views in central Biarritz - La Raffinee is positioned right in the heart of this elegant town, with restaurants, cafes and sandy beaches on the doorstep. Located in an attractive and distinctive building, this fashionable second-floor apartment is air-conditioned throughout and offers a spacious, open-plan living area with a state-of-the-art entertainment system and three comfortable double bedrooms. Make yourself at home at Skyview, our beautiful hillside property overlooking the sparkling beaches of Biarritz. This two-story house is only a five-minute walk from three different beaches, including Ilbarritz, one of the top-rated beaches in the area. Saint Jean de Luz may not be as known as Biarritz, but it is undisputed that it offers a more authentic Basque experience. Not only was the town a favourite haunt of the pirates in 17th century, it’s also where Louis XIV secured an alliance by marrying a Spanish princess. Time spent in the Dordogne of France's southwest is never forgotten. There is a special quality of life and strong sense of history in this region that affects all who come here. The region's prehistoric history is most apparent in the well-preserved sites ~ the Grotte de Lascaux is an important example with its paintings by early man ~ and that the Dordogne is considered the birthplace of modern (Cro Magnon) man. Biarritz vacation villa near beach – set in 15 acres of parkland in the heart of the Basque countryside just outside Bayonne, La Tuiliere is just 6 miles from the nearest of the beautiful sandy beaches that grace the long coastline of the Cote Basque. Odin Beach is located in the golf course of Chiberta in Anglet, between land and sea. A dreamy location! You will enjoy the peace and quiet of Anglet, its pine trees forest and sandy beaches, a 5-minute drive from Biarritz and its vibrant atmosphere. Stunning villa you'll love spending your holidays at! This stunning, modernised Basque villa with heated pool is in an enviable village location overlooking the Atlantic ocean and the western Pyrenees.You can stroll to restaurants, cafes, shops and the village square from your front door, walk down to the sandy beach, or walk the excellent footpath that runs the length of this stretch of coastline. Villa Perle is a luxurious, modern villa with beautiful ocean views situated between the typical fishing village of Guethary and the chic town of Saint Jean de Luz. The villa is exceptionally well finished with sleek, contemporary furnishings and state of the art fittings. Nestled on top of a hill in Biarritz, in one of the area’s most exclusive neighbourhoods, Beausite offers guests utter privacy & seclusion. Beausite means beautiful place in French and this exceptionally beautiful villa certainly lives up to its name. An architect’s house where calm and serenity are the keywords. South-West facing, surrounded by a large terrace of 450 sqm, and enhanced by an infinity swimming pool, the hous offers a 500 sqm living space on two levels. The magnificent Grande-maison is of huge proportions and is perfectly suited to catering for large numbers, whilst at the same time various different living areas ensure that guests, if they wish, can enjoy some privacy and independence from each other. Dordogne chateau for holiday rental - set in the heart of the country with stunning views of the Dordogne valley and surrounding countryside. 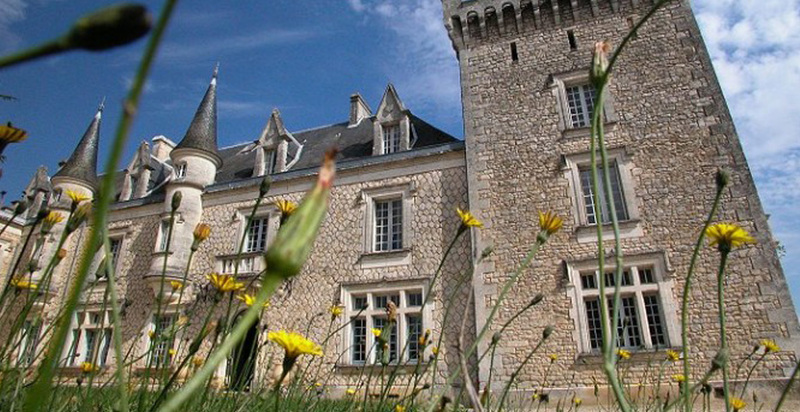 Chateau des Legendes has been in the owners family for many generations and thus has a feel of real history. Grottos and Cro-Magnon cave paintings make the Dordogne (Périgord) the birthplace of modern man where history and prehistory entwine to make each visit a new discovery. Today, the distinctive regional cuisine, appealing culture, delightful villages, and tranquility found in the region mean that it is all the more interesting as a holiday destination. At the heart of Bassin d’Arcachon, tucked between the sea shore, the pine forests and world renowned Bordeaux Vineyards of France, La Tour d'Arcachon is an exclusive country estate offering 8 chambers with en-suite bathrooms. Four luxury rooms retain their original marble fireplaces, and the tower suite “La Tour,” with its 360 degrees floor to ceiling windows, offers breath taking sea and forest views; even for our most traveled guests. Perigord - large villa with pool to rent - this homely villa is set in 32 acres of forest and woodland and was built in 1780. There is something for everyone at Les Amandiers. A large covered terrace with valley views, overlooks the pool and provides shelter. This exceptional Basque family villa rental sits proudly on the surf-washed shores of the French Atlantic coast with inspiring panoramic views of the Ocean and inland to La Rhune, the highest peak in the Pyrenees-Atlantique mountain range. Floor to ceiling windows and sliding doors are predominant throughout the house making the most of the light and the glorious views from all rooms. Accommodation near Biarritz with heated pool - set in a beautiful 19th century stately home with 6 acres of woodland and mature gardens and majestic century-old trees, this property offers all the ingredients for a perfect stay. Les Collines is an impressive large Dordogne villa with heated private pool, in a private 120 acre estate, with lovely uninterrupted views. A stylish use of colour adds great character. Each room has been uniquely decorated, using hand made fabrics. Modern art and photography adorn the walls. Isly Lanouaille Château is the ideal place for a wedding, a birthday party, a family get together or a relaxing and enchanting holiday. It is located in the Perigord Vert, a beautiful and tranquil part of the Dordogne, Southwest France, which is very well connected with flights to the UK and trains to Paris.